The Ataqa Power Plant in Egypt draws its feed water from the Red Sea. A power plant in Egypt needed to use seawater from the nearby Red Sea as feed water for its plant processes. 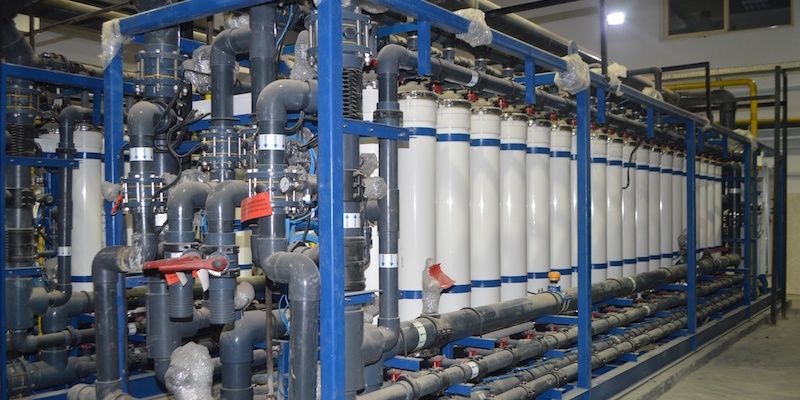 This case study shows how Fluence designed and built a new seawater demineralization plant that includes an ultrafiltration pretreatment, reverse osmosis, and mixed bed ion exchange. When the Egyptian Ministry of Electricity decided to increase the country’s power generation capacity, the Ataqa Power plant on the Red Sea was slated for expansion. The goal was to build a new, state-of-the-art water demineralization plant that would use feed water from the Red Sea to produce ultrapure water for steam generation and other plant processes. The general contractor in charge of the new plant chose Fluence to design, supply, and commission the plant. The project posed several challenges. First, the Ministry of Electricity issued a very tight schedule to complete the construction. Second, the raw seawater was of very low quality, with high levels of contaminants and total dissolved solids (TDS) levels often as high as 42,000 ppm. The Fluence design team decided to implement three independent, fully-automated trains with a redundant control system. An ultrafiltration pretreatment step was selected to remove contaminants before the reverse osmosis stage. Fluence’s project team also created an aggressive schedule with specific deadlines for each task and installation. As a result, the company was able to deliver the first train in four months, and the next two trains only two months later. The Ataqa power plant was able to start using its new seawater demineralization plant on schedule. With two independent trains running at all times and one on standby, the plant can generate demineralized water at the requested rate (3×1,200 m3/d). If you’d like to learn more about Fluence’s ultrapure water and desalination treatment solutions, please contact our experts to discuss your next project.